Study validates brief diagnostic scorecard in nations such as sub-Saharan Africa, Bangladesh, Indonesia. 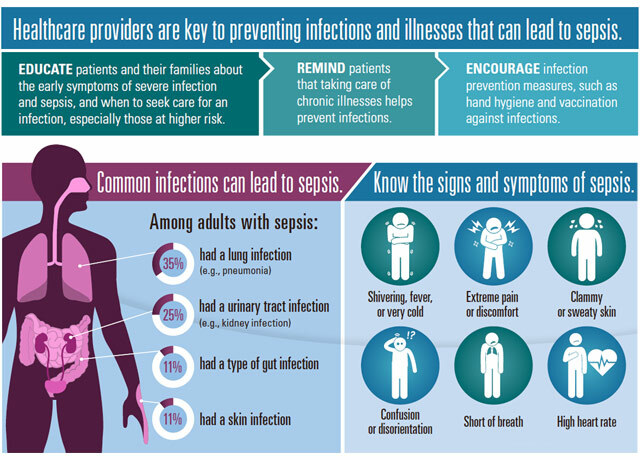 The CDC published this graphic on sepsis recognition and prevention in 2016. The patient in front of the doctor is breathing heavily, sweating and her heart is racing: classic signs of sepsis. But the physician, perhaps attending to blood loss from the patient’s leg wound or another pressing need, might miss the signs – especially if this scene unfolds in remote Africa or Vietnam. In such locations, even if the physician suspects sepsis, he or she may lack the resources to diagnose sepsis and to confirm the causal infection. “There may be the cost factor or a time factor,” said Dr. Kristina Rudd, a UW Medicine critical care and pulmonary specialist. In a research paper published today in JAMA, Rudd evaluates a brief bedside numeric-scoring tool to help physicians diagnose sepsis and avoid sending a patient home with the condition, which claims about 5 million lives each year. Rudd presents her findings today at the American Thoracic Society International Conference in San Diego. A map of study locations in research by Dr. Kristina Rudd et. al. Globally, nearly 20 million people a year suffer from sepsis. The condition results from a dysregulated immune response to infection: Some elements of the immune system are overactive and other parts aren’t active enough. It often leads to organ failure or injury. Traditionally the medical community has relied on criteria to identify “systemic inflammatory response syndrome,” or SIRS, to ascertain cases of sepsis. “In our study, we found that it didn’t work that well,” Rudd said. Sometimes a high SIRS score wouldn’t correlate with a patient having sepsis. Other times a patient would have a low score, only to die later after returning home from the clinic or hospital. The SIRS analysis requires lab work for a white blood cell count, which is often unaffordable in poor nations. Most sepsis studies Rudd reviewed before pursuing this research involved sepsis in wealthy nations such as the United States or Germany. These studies’ findings had little practical application in poorer areas of India, Haiti and Sierra Leone, from which some data in her study was drawn. Rudd and colleagues at the University of Washington and the University of Pittsburgh evaluated the efficacy of a different test, the “quick sequential (sepsis-related) organ failure assessment,” or qSOFA. The investigators reviewed data from nine studies in countries designated as low- or moderate-income, comparing qSOFA and SIRS for accuracy and value. Data represented 6,569 patient cases with suspected infections in emergency departments, inpatient wards and intensive care units of 17 hospitals in 10 countries in sub-Saharan African, Asia and the Americas. The team concluded that qSOFA provided a more accurate, and viable, method for caregivers to assess a patient’s likelihood of sepsis. qSOFA requires no lab work, only that the doctor completes a list of observations of the patient’s blood pressure, mental status and respiratory rate at the clinic or hospital. “This could be done by a non-physician such as a nurse or a community health worker,” Rudd said. The collaboration offered a window into how different observation practices worked in areas with high HIV rates and in other areas where Lassa fever, similar to Ebola, might be the main disease that doctors face. The data were collected by researchers around the world as part of separate studies. Rudd and her team contacted a network of peers to ask who might have the type of data sources they desired. The researchers and clinicians who worked on the original nine studies, numbering nearly 100, volunteered to collaborate on this secondary analysis, Rudd said. The next step, Rudd said, would be to formally test the qSOFA technique in a research setting, and then in a broad clinical setting – outside of the U.S. and Europe, she stressed. Other primary researchers in the study included Dr. T. Eoin West of the University of Washington School of Medicine and Drs. Chris Seymour and Derek Angus of the University of Pittsburgh.